I really like the purple and teal square doily pattern by Debbie Arnold and would like to make one for myself. It would have taken me a long time to accomplish the task if I didn't have a deadline to work against. So, the deadline for entries to the Castle Hill Show this year comes in handy. 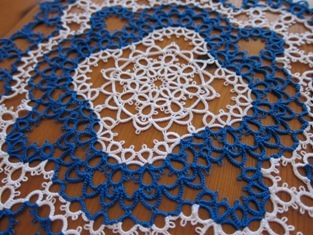 I picked blue and white colours for my version of the doily. After 10 hours into tatting the doily, using cotton size 50, I broke a couple of tatted stitches while sewing in the tails. Now, what did I want to do....give up or start again? I would have felt some kind of failure to give up, so have decided to have another go. This time, cotton size 20 was chosen so that I could actually see what I was doing and I could appreciate the stitches better. Rainy days and being sick with flu helped me to sit still longer at one time. A few long sessions of sitting down and a total of 50 more hours later, I have managed to finish the doily. It will be on its way to the Show this week. There was 'trying time' in the process, with having to unpick a few rings and chains when I wasn't fully alert and didn't read the pattern carefully. If some people think unpicking sewing stitches is hard, try unpicking tatted stitches. The former one would seem 'easy peasy lemon squeezy', as my Sunshine often says. :-) I'm, of course, pleased with the doily. I have also felt that I have had a good share of tatting split rings for quite some time, from now. 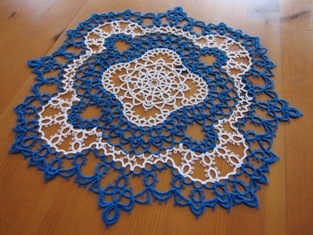 So, I will just stick with tatting rings and chains for my next tatting project....But before embarking on another tatting project, my next immediate task is to find a place for this newly finished doily in my 'spacious' home.!! Wow! This is truly glorious! I'm sorry to hear that you were I'll but maybe it was worth it? This is an absolutely stunning piece! Thanks very much, Michelle, for your complements. :-) The pattern was interesting to tat and I enjoyed it very much. I'm now tatting 4 metres of an easy edging for a runner to be placed on top of my piano. 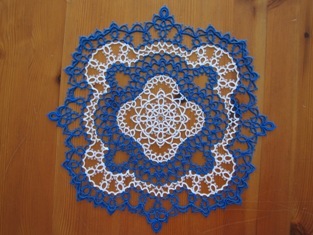 After I finish this project, I may tat another one of this doily in different colours. Cheers.